After Hurricane Maria hit Puerto Rico on September 20, 2017, the world watched as the island surveyed unfathomable damage that left many people without electricity, water or a way to communicate. 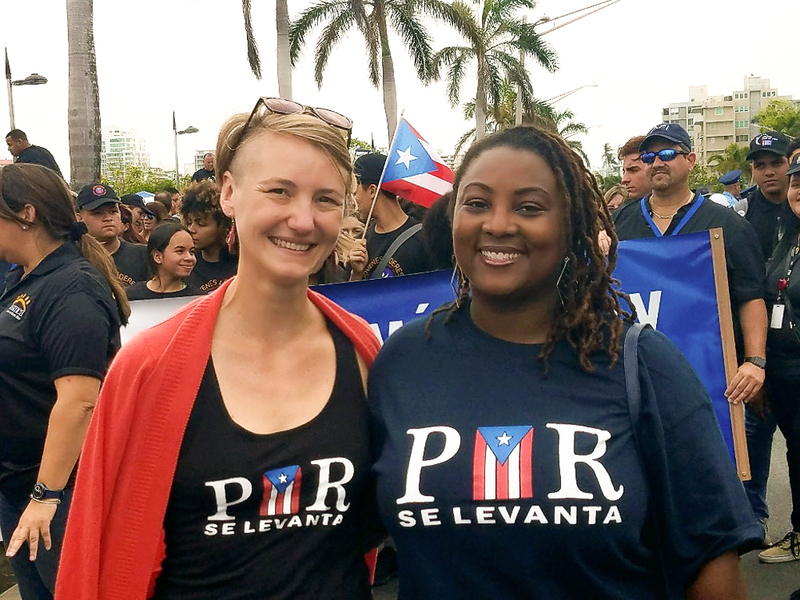 Kate Thanel, MPH 2010, and Chaunetta Jones, MPH 2013, who also holds a doctoral degree from Rutgers, answered the call to serve in Puerto Rico. Kate Thanel, on the left, and Chaunetta Jones, on the right, pose in Puerto Rico. The two alumnae, who had never met before deploying to Puerto Rico, became the two-woman Behavioral Health Branch working as part of the Health and Human Services Hurricane Maria Recovery Mission. They shared some of the moving encounters they experienced in Puerto Rico during their three months together on the island. Damage from Hurricane Maria is still present as the recovery effort continues. During our time in Puerto Rico, we have crisscrossed the island to assess our partners’ needs for hurricane recovery. The hurricane had an impact on every level of society and on institutions from schools to healthcare to community services. The road to recovery requires the assistance of experts with specialized knowledge to address the breadth of critical health and human services issues. One teacher lost almost everything during the hurricane, including her home and most of her possessions. Her school was also severely damaged, and her class is now housed in another building. Even amid personal tragedy, her mind was on her students, and she managed to salvage two story books from home for her classroom. Four months after the storm while waiting for new school supplies, she was still using those two books to create lesson plans for her classes. The director of an adult daycare center walked 15 hours after the hurricane, navigating severely damaged and debris-blocked roads, to successfully locate one of her participants who was unaccounted for. Staff members of a local psychiatric hospital assembled teams among their ranks to care for the special needs of their patients for 21 days – all with no running water or electricity. A school administrator described how all the teachers and staff worked together to clean up the school after the hurricane, chopping up and removing fallen trees, discarding rotting wooden furniture, and cleaning mud – and later mold – off the classroom walls so that kids could go back to school. A clinic administrator described how the community helped get the clinic back on its feet. Neighbors came to the clinic and volunteered to clean and act as security to allow the staff to treat patients just 48 hours after the hurricane hit. 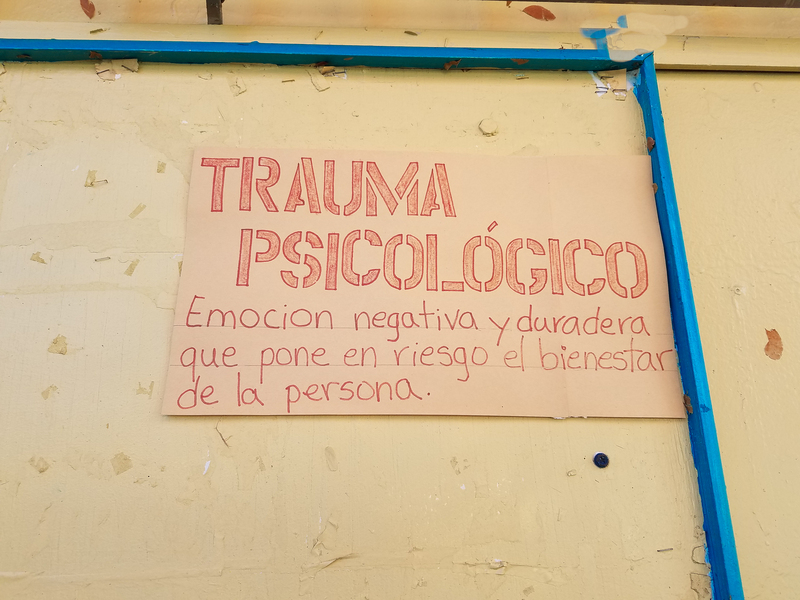 This sign offers help for individuals traumatized by Hurricane Maria. 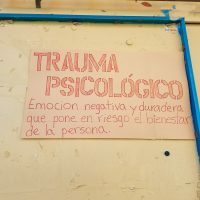 We are working to ensure that long-term recovery recommendations and intervention strategies are inclusive, based on community needs and address problems at every level of the social ecological framework. Our ultimate goal is not only to help restore services, but to support and empower local partners to build a system that provides the best possible service to the Puerto Rican people. 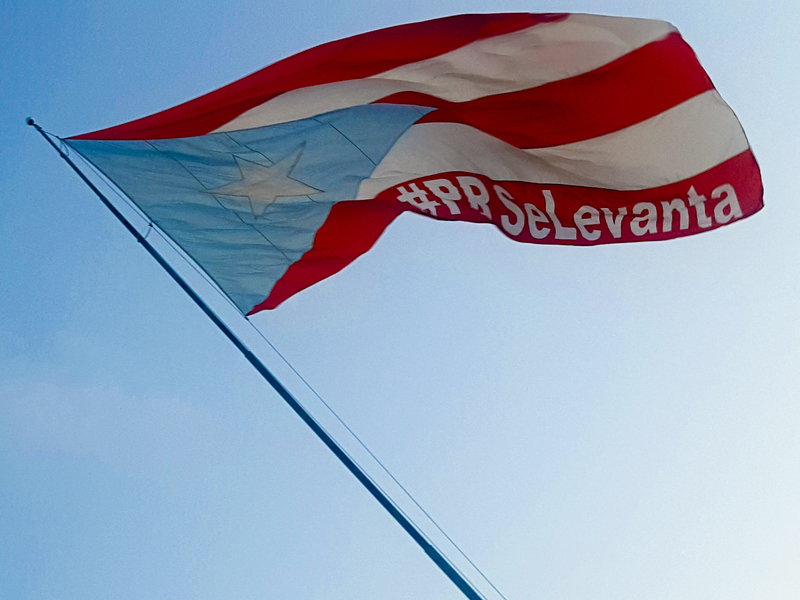 This flag shows “Se levanta,” a rallying cry for the recovery effort in Puerto Rico. Despite the obstacles, Puerto Ricans have been pulling their lives and their communities back together in the months since the hurricanes. There is still a long way to go, and we hope that our small contribution can help move the island one step closer to recovery. Since graduating with a master’s degree in health behavior in 2010, Kate Thanel has worked in community health in Haiti and the Dominican Republic with Partners in Health and bounced between East Africa and South East Asia conducting family planning research with Population Services International. After completing the master’s degree in health behavior in 2013, Chaunetta Jones earned a doctorate in medical anthropology from Rutgers University. Now she works for the FDA Center for Tobacco Products, where she develops and evaluates media campaigns designed to prevent and reduce tobacco use.